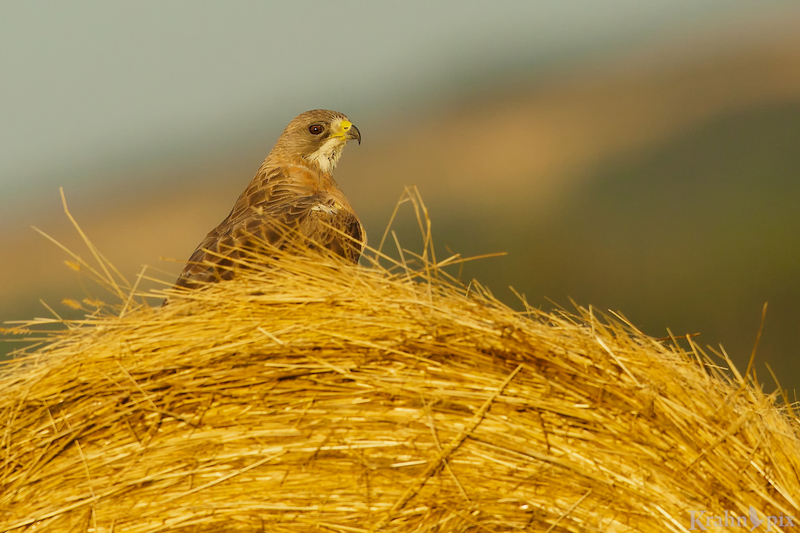 Just another gorgeous hawk hunting from a hay bale. I thot there were rules about these situations. They were just supposed to work … like gravity or hawks flying away. I find a hawk and immediately run sophisticated mathematical probabilities in my head to determine how close I can get without scaring it off. By that time, I’m coasting with the engine off and my truck window open. I take a few shots – or not. Sometimes I get out of the truck to get a little closer. In every case the hawk has flown off at some point in the process. Sometimes it happens before I even start slowing down and occasionally after I’ve waited a long time and looked away for a second (oh they know!). Occasionally I get a photo worth keeping though I’m pretty sure it has nothing to do with the dubious math. Just another perfect summer evening with yours truly and a hawk. Now I may not be the sharpest knife in the drawer, but when something happens 100 per cent of the time, for an insane number of repetitions, it seems like a rule. It’s predictable. Right? One day I found myself standing on a lonely dirt road. I was a little surprised when a hawk left a high branch, circled above my head and returned to the tree. There was no nest or any reason I could see for it to hang around. I was so excited to hear that scream and get multiple photo opportunities that I didn’t notice the changing flight pattern. The adrenaline starts pumping whenever I get a hawk in my lens. The pump was in high gear when I saw the hawk flying in my direction. What an opportunity! When the hawk’s eyes kept getting larger and larger in my lens, it suddenly dawned on me that the rule wasn’t working. I was getting dive bombed! Now a hawk can look a little vicious just flying around. When magnified many times through the lens looking head on, it’s spectacularly impressive – we’re talking about a wingspan of nearly five feet. The hair on my neck might have risen a little. All the hawks I had met previously, like this one, look friendly enough. Tracking a predator through my lens makes it quite difficult to judge distances. The hawk was veering off only about 15 feet away at high speed. It suddenly occurred to me that there was no time to duck a close encounter. I had a choice – either stay and take my chances or retreat to the safety of my truck. I quickly decided to stay after determining that at least there was a big lens between me and the hawk (would a talon scratch on the lens be a badge of honour?). The screaming hawk flew straight at me again – a chilling scene fit for the movies. I winced, fired, then did it again. Eventually the gathering darkness pulled the curtain on our little drama. I retreated to the truck, carefully walking backwards – a cautiousness that had me smiling and the hawk smirking. Upon reflection, the choices I made turned out quite different than the possibilities I imagined. I thot I was choosing between safety and incredible photos – I wasn’t. It was far too dark so none of the fearsome photos turned out and the hawk never came any closer. I do know that getting the shot was important to me and I discovered that even strict adherence to a pattern doesn’t make a rule. Here’s hoping I find another rogue hawk in better light. Now I’m wondering what other rules or choices will surprise me. Smart phone users – unfortunately this new design has an issue with smart phone users making comments (the issue is that it doesn’t work yet). Hopefully WordPress can resolve it quickly. From what I can tell, there doesn’t seem to be a problem with commenting from computers or tablets. Please let me know if you notice anything else lyle@krahnpix.com – I’m still working my way through the redesign. Great fun. As always, I appreciate hearing from you. Your story reminds me of Hemingway’s “The Old Man and the Sea,” in which the man succeeds but has little (physical) to show for it at the end. Interesting. Success is so relative to the way we define it and sometimes it’s hard to know when we’ve done well without the benefit of hindsight. You’re so right that beauty can be found in so many different ways – it’s just ours to discover. 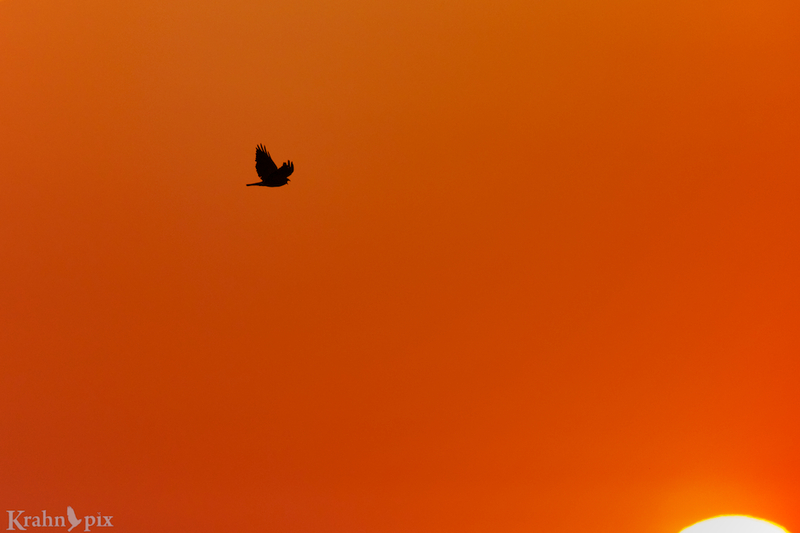 I’m glad you like the sunset/silhouette shot. That was a special one for me. I guess the moral of the story is that there are no rules with wildlife behavior…just likelihoods. Love that flight shot, Lyle.. I guess they are some similarities to people – don’t make assumptions. Love the look back from the bail of hay. Sweet capture. Thx. That was a special evening a pretty photogenic hawk. I wonder what he was upset about? Shouldn’t have any young around at this time of year. But man, they can be scary – gives you a good idea of what a mouse feels like when the hawk is after him. A Goshawk came after me once, and I didn’t hang around to see if he’d do it again! I’m quite happy not to be part of that eat or get eaten world. Either their survival skills are strong or they die whether its predator or prey. Looking in from the outside it is fascinating. Thanks. They bring back wonderful memories of gorgeous evenings. Great photos of the hawk and a great narrative. I had also forgotten that Lyle has made a head start on simplifying the English language. Notice his spelling of âthot.â We ot to send this blog on to the dictionary editors. Thanks Murray. It’s my plot to change the world that started here https://krahnpix.com/2013/01/28/a-sinister-plot/. As for dictionary editors – I try to hide from them. Awesome shots and story, Lyle! Thanks so much. I hope it happens again. What incredible hawk photos!! I also loved the descriptive story displaying a thrilling photo adventure. I love your hawk shots and am not surprised that you were willing to risk life and limb to get shots when being dive-bombed. Have you considered wearing protective gear, especially a helmet? The hawks have a strange appeal to me – maybe it’s their photogenic potential. I’m not actually convinced that there was a real threat but it sure got my attention. I think I’ll leave the helmet for more serious endeavours. Gorgeous shots, Lyle! We’ve had a Cooper’s Hawk hanging about our yard the last few weeks and it takes barely a twitch of my binoculars and it’s gone. Thx. Those hawks can be quite twitchy. There’s a reason I don’t keep track of all the ones that quickly fly away. I’m pleased to hear you enjoyed it. I had a lot of fun that day. Adventure is a great word for it. HAHAHAHA! I am glad you risked personal injury for the pursuit of a photo – I don’t feel alone. Great story. It turns out we do strange things in the pursuit of what we enjoy. In this case it just so happens to be photography. Very true. I have done stupid things for women, golf, travel, and photos. Well that’s an interesting list! I suspect the order may not be random. I really enjoyed reading this because you put me right there with you. Well done. And what’s not to like about a great hawk story?! Glad you liked the story – it was fun being there too. I went back to the same spot a few weeks later and there were hawks in the area but no repeat performance. Beautiful photos, Lyle. Curious why the hawk considered you a threat. I’ve had them fly low at times and take a real good look at me, but never had one come at me. It was strange especially given all the hawks I’ve watched before and it never happened. Glad you liked the photos.